Sfoliatelle is a street food that is sold on Italian street corners and the word means many layers. 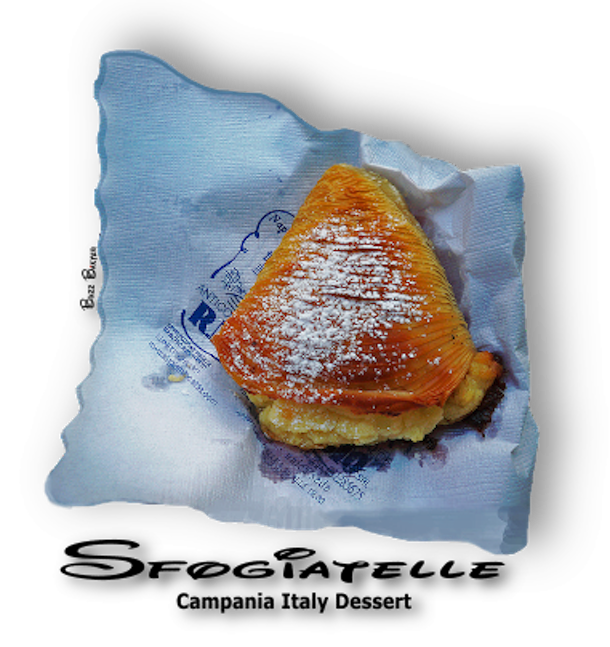 They have been called "lobster tails" for their resemblance of the tail of a lobster and the word "sfogliatelle actually means shell which the pastry also resembles. Italians love their desserts, and the effort , taste and artistry shows just how much they love them. To make them for the first time seems like a daunting task, but once you get the hang of it, becomes busy work and the difficulty is greatly reduced. •  1 tbsp orange flower water (found in health food stores,  Asian or Mediterranean markets. 1. Sift flour and salt and turn into bowl. 2. Rub the shortening in with your with fingers. 4. Make into 4 balls and chill for 30 minutes. one strip, top with second strip and spread with shortening. shortening, lard or butter. Let the melted fat cool and set. should resemble a rolled up newspaper about 6 inches wide and 2 inches in diameter. 6. Wrap the rolled up "logs" in an absorbent kitchen towel and chill 4 hours. 1. Pre-heat oven at 400ºF. 2. Now , cut each roll into 10 even pieces which will look like rolls of ribbon . 3. Now to make pocket to hold the filling. of the pastry bag. Fill well,  but do not over-fill. and bake them at 375ºF for 15 min. or until they are golden flaky and crisp. 7. Brush more melted shortening, lard or butter over shells using light, gentle strokes. 8. Bake for 10 - 15 more until they are puffed up and golden. These are best eaten right out of the oven! thickness would be more uniform as well and make the appearance of your sfogiatelle much nicer. 3· Dough cylinders can be chilled up to 2 days, or frozen 1 month. Thaw before proceeding to reheat. 4· Filling can be made 1 day ahead and chilled, covered. PART IS PROBABLY THE MOST DIFFICULT PART OF THE RECIPE TO VISUALIZE. I HOPE IT IS OF HELP.